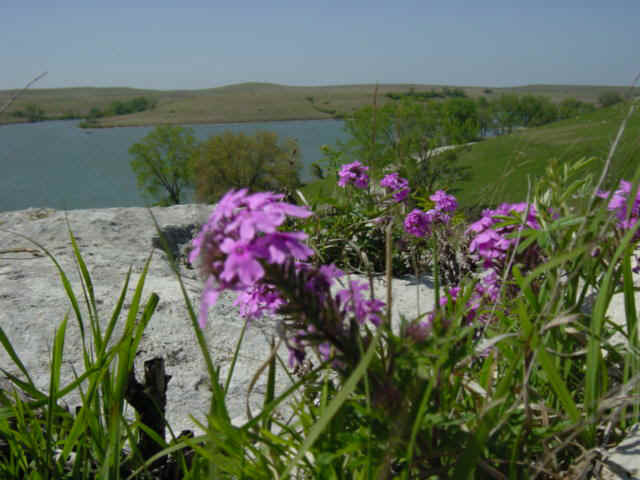 - All photos by Jim Mason This park, with its beautiful 109 acre lake, is an ideal spot to hike the tallgrass prairie and explore the limestone-capped hilltops. Springtime sprinkles the countryside with colorful wildflowers. In the spring and summer, the large flat rocks on the hillsides are ideal hiding spots for reptiles. Rose Verbena may often be spotted growing from rocky crevices on the hillsides. Give it a sniff! Rose Verbena has a delightful fragrance. Look for collared lizards, Great Plains skinks, ringneck snakes, prairie king snakes, and racers. If you search under the rocks be sure to replace them in the same position that you found them. The many burrows, holes, and cavities under the rocks take years to develop and are a small but important habitat to a wide variety of reptiles, small mammals, and invertebrates. Spring birds bring a variety of sounds to the lake area. Listen for the wolf-whistle call of the upland sandpiper, the insect-like buzz of the grasshopper sparrow, and the melodious call of the eastern meadowlark. Other frequently seen birds include common nighthawks, northern harriers, and American kestrels. The trees around the lake also attract woodpeckers, orioles, robins, and flycatchers. During spring and fall migrations, the lake attracts a variety of ducks, and a few Canada geese usually overwinter here. For campers, nighttime often brings the calls of the common poor-wills, which nest on the open ground amid the rocky outcroppings. You are likely to hear coyotes before morning and may see bobcats below the dam. Directions: From K-177 in Cottonwood Falls travel west on Main Street 2.6 miles to the lake entrance. 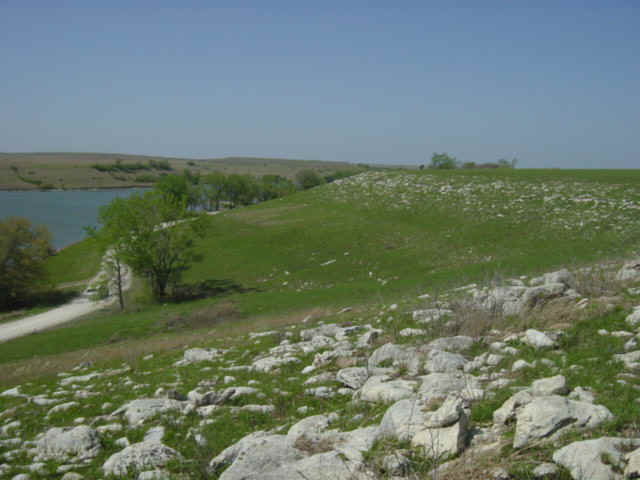 You may download the KDWPT brochure on Chase State Fishing Lake from their web site.